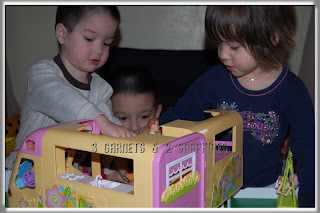 If you do not have room for a dollhouse in your home, then I invite you to take a look at this toy camper recently introduced into the Caring Corners line by Learning Curve for Fall 2009. 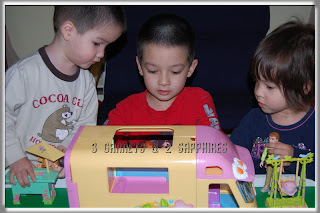 Just like with a real life camper, this toy fits as much as humanly possible into a very compact space on wheels. 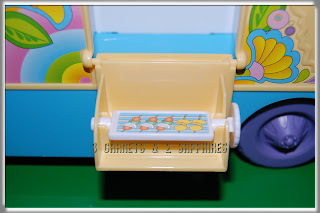 The Daisy Greenway Interactive Camper is available to be purchased either by itself or in a value pack, which includes figures and other accessories. 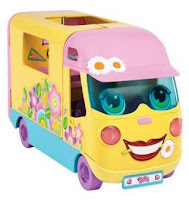 1) My first thought about this camper is that it exudes a feeling of happiness. Everything from the colors to the style of the decals to the daisy in the teeth . . . all scream carefree living. 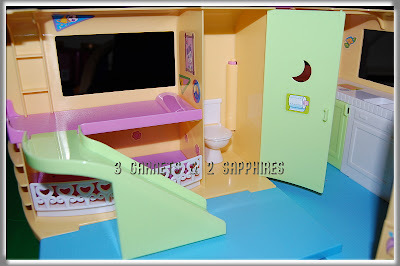 2) When I first saw this toy, I thought it was very girly, so I wondered whether it would appeal to my two sons as much as it would my daughter. Well, my concerns were unfounded. Both my sons (almost 3 and almost 6yrs old) enjoyed playing with this toy just as much as my daughter (also almost 3). 3) Although there were many decals included, most of the important ones were already applied. 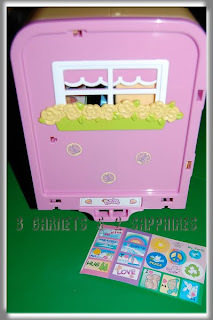 This is a great feature for younger children because they do not need to wait for an adult to help them with the decals before they can start playing. 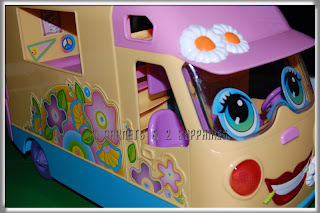 I also like that many of the decals do not need to go in a specific place, so your child can customize their camper the way they like, right down to the bumper stickers. 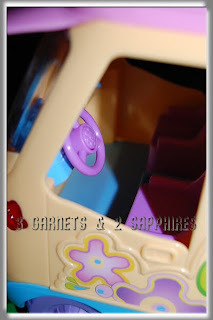 4) My children's favorite thing to do is to push Daisy Greenway's horn on the steering wheel. When they do this, she sings a fun tune, her headlights flash, and the horn honks. As an adult, you may find it annoying after the tenth consecutive push, but the kids just love it. 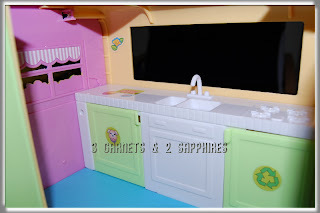 5) These are some of the features that I found to be fun and innovative about this toy . . . There is a slide that can be used in two different places. There is a double-sided grill that flips down on the exterior. One of the cabinets under the kitchen counter opens up to a pet bed complete with a food and a water bowl. The other cabinet under the kitchen counter opens up to a 2-compartment recycling bin. Daisy Greenway's eyes can manually be moved from left to right with a lever on the dashboard. There's a pretend LCD television that flips down behind the passenger seat. 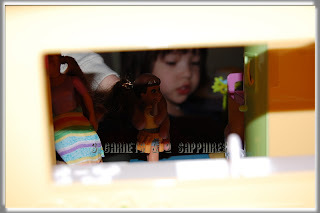 There are multiple windows where your child can look in from the outside and the figures can look out. 6) I think this toy is perfect for two children, but not more than that, unless you pick up some other accessories like the picnic table. 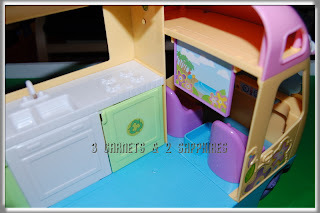 As you can see, my three enjoy playing with this camper very much, but it is a tight squeeze for more than two children to have access to the camper at once. 7) My children had to learn to be careful not to move the camper when the support leg was down beneath the side that swings open. If the camper is moved, the leg will shift and won't support that side, which comes off fairly easily if any weight is put on it. 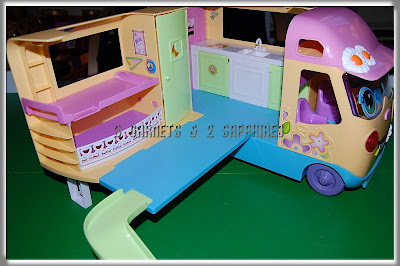 To learn more about the Daisy Greenway Interactive Camper or the rest of the Caring Corners toys, visit the Learning Curve Shop. 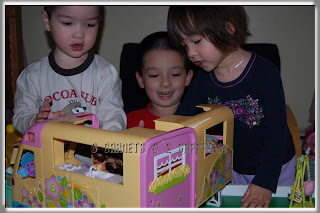 You can purchase Caring Corners toys right on the website or at other major toy retailers, such as Amazon.com, Toys R Us, Walmart, Target, and more. Thank you to Learning Curve for providing us with both a review product and a contest prize free of charge. 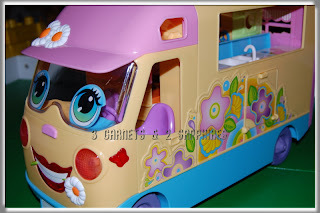 One lucky reader will receive a "Daisy Greenway Interactive Camper" by Learning Curve. Visit the Caring Corners product showcase. Then leave a comment telling me what other toy from the Caring Corners line would make a great gift for a child in your life. You MUST do this to be eligible to win this contest. 4) For 10 extra entries, blog about this contest linking back to this post AND LearningCurve.com . Then come back here and leave TEN separate comments with the link to your blog post.